LabTech Plugin – Printer Health Status [LabTech] IPBlock Windows Firewall plugin. A new plugin is under development here inside the Squidworks garage that allows Labtech MSPs to manage Dell Appassure Backup Cores servers from a common console inside of Labtech. The new plugin leverages Appassure REST API to mine data from each core and send that data back to the Labtech database. Using the same processes the plugin is able to send commands back to the cores to preform various tasks like start a new backup or replication. The plugin provides a common view of each core at the location level console in Labtech. You can select one of many cores at any location and view the protected servers managed by that core. Selecting a protected server provides details about that server and the list of snapshots preformed on that system. We have many great features planed for this plugin so start following us now! The plugin is still under development and will we have a release for early beta testers. Place a comment here you would like to be notified of updates and being included in the beta testing. Count me in for the Beta test! Would be glad to help! I used to work for AppAssure, will be interesting to see how this works with 5.4 since they changed a bunch of their PS commands. Any help you need, let us know. Be glad to test the plugin. This would be great, include us in the Beta or full version ASAP. Thanks. Add me to the beta too please. Ah , new found life in this plugin. I was really struggling to keep interest in this guy with Dell changing all the powershell around and all the version issues but I have discovered the REST api they use for the web and have a new data miner script that is working across all versions strait back to the early releases of 5. It works on vista class and Windows 8 class systems and will require powershell 3.0 which a script will be provided in the bundle to update core servers. I should have a simple beta out, I hope by weeks end. I left out one table in the code, the events table and this caused a exception in the code. I have fixed this and have re uploaded the new copy. Anyone who has downloaded this plugin need to reinstall plugin with new version. We have a new release out if anyone is looking for an update. Awesome! Thanks, will give it a try this weekend! – we are 90% complete on our integration as it is but we will take a look at what you have going. I really like this plug in and it looks promising, but I have followed the instructions in the readme.txt and it still will not pull data from the cores. 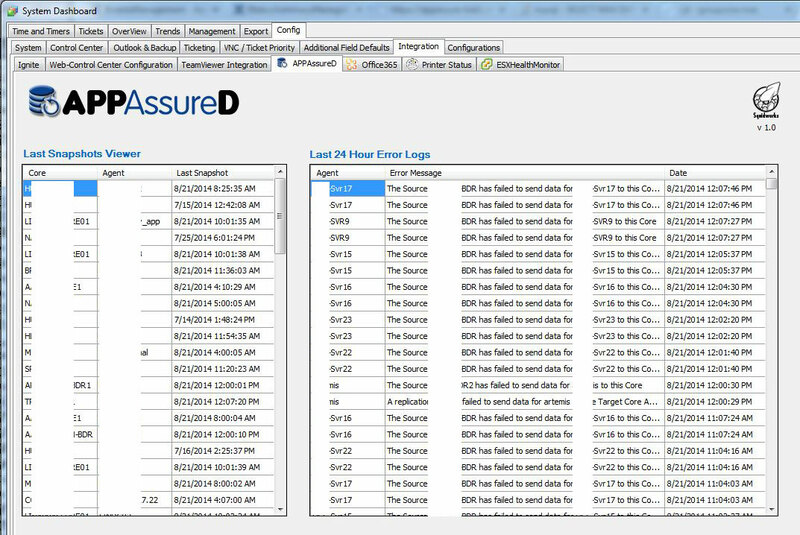 We have over 20 clients with appassure and was hoping this would make life easier. Has any on been able to get it working? dis regard my last post its working now. I have the scripts loaded and the dll. I get the APPAssureD tab, but when I click on it, nothing happens. Any idea? 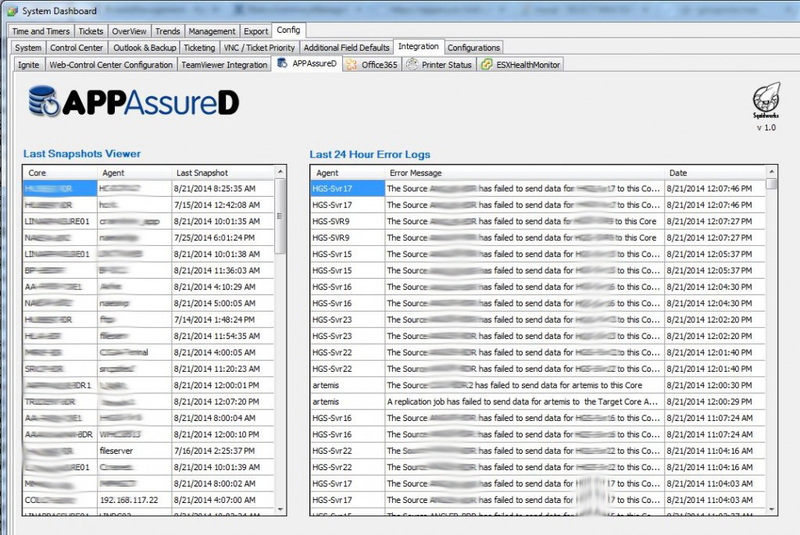 Once everything is imported you should find the group Appassure Cores and make sure the Appassured script is scheduled to run every 2 hours. This script is what populates the data, you can manually run it on any core at anytime to refresh data for that core. Apparently the screen has to be larger than a specific size for the tab to work. I found this out accidentally. With that said, in your instructions you said that we must use PowerShell 3.0. My cores are installed on Windows 2012R2 which has PowerShell 4.0 installed. So far, I see no data from running the scripts. PowerShell 4.0 should run 3.0 scripts. Have you tested the scripts on 4.0? Thanks. I was wondering if someone could send me the latest download for testing today. You only need to select the “Download” button above to download the zip package that houses the plugin and scripts,groups and searches. This worked out well, thank you. Does the plug-in create tickets as well? I’ve followed the read me. 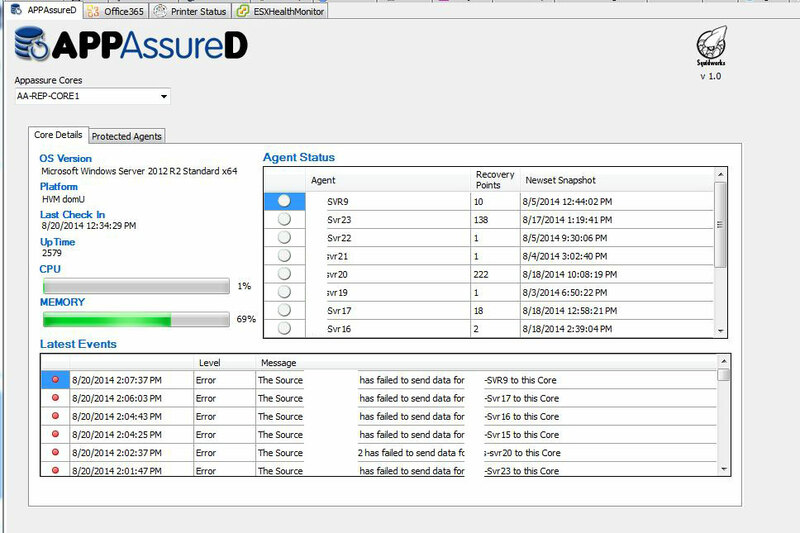 The Core agents are well populated in the Appassure Cores group. Output: ERR an error occurred: Could not find file ‘C:\Windows\LTsvc\AppassureD\AppassureEvents.sql’. “, the AppAssureRecoveryPointStatus.sql and the AppAssureAgentInfo.sql are well generated. Because of this error, no data are displayed on the dashboard. I am interested in the continued development of this plugin. Can you tell what tables you are dropping the data into? We are not seeing data on the AppAssureD tab and I don’t see it listed under plugin_* in the table list in the mySQL DB. We are very interested in this plugin and would like to be included in the beta. Feel free to download plugin and use as you like. This is a great plugin for Automate… but with Dell offloading AppAssure and the product version 6 is now Rapid Recovery – are there plans to update the plugin to work with version 6? Much appreciated!